We’re looking forward to welcoming another affordable model into the Sportster range of motorcycles after Harley-Davidson®announced the introduction of the new Harley-Davidson® Roadster. Prices start at £9,695 OTR for the new machine, which is inspired by classic racing motorcycles and current trends in stripped-down, naked custom bikes. Shaped by nearly 60 years of heritage and stripped to the essential elements of a pure riding machine, the new Harley-Davidson® Roadster™ motorcycle is another opportunity for us to help you create your ideal Dark Custom machine. At home in urban landscapes and on twisting roads, the Roadster delivers modern performance with a combination of new wheels and tyres mated to premium suspension components and an air-cooled 1200cc V-Twin engine. The 19-inch front and 18-inch rear Offset-Split 5-Spoke cast aluminum wheels were designed specifically for the Roadster and contribute to its balanced, athletic stance. 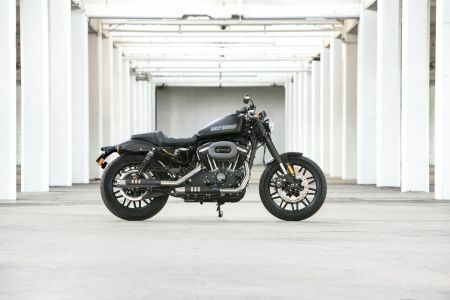 They’re complemented by an aggressive riding position with a new low-rise handlebar and mid-mount foot controls, which centre the rider’s weight over the classic profile of the 12.5-litre Sportster fuel tank. The Roadster offers greater suspension travel than any other Sportster model and outstanding stopping power is achieved with dual floating rotors on the front wheel, with ABS brakes fitted as standard. The rear fender has been clipped shorter than previous bobbed Sportster fenders to add to the stripped-back styling. Rear turn signals are mounted directly to the fender struts, while a new license plate, rear lighting module and fast-back seat design give the rear of the bike a tight and uncluttered look. The Roadster will arrive in dealership in June. Call in to find out more or to register early interest.